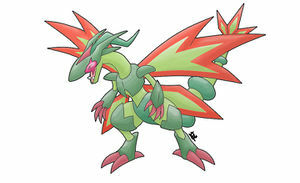 Flygon is a dual-type Ground/Dragon Pokémon. It evolves from Vibrava starting at level 45. It is the final form of Trapinch. 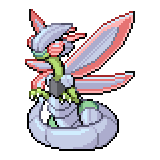 It can Mega Evolve into Mega Flygon using the Flygonite. It can transform into Armored Flygon while holding the Flygon Armor. 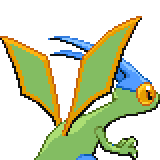 A level of "Start" indicates a move that will be known by a Flygon obtained at level 1. 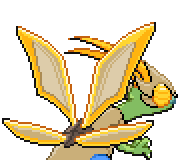 Flygon shares its species names with Xatu. They are both known as the Mystic Pokémon in English, and the Spirit Pokémon in Japanese. 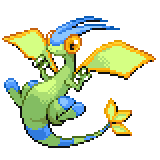 Flygon is the only fully-evolved Pokémon lacking a Hidden Ability that evolves from a Pokémon with a Hidden Ability. 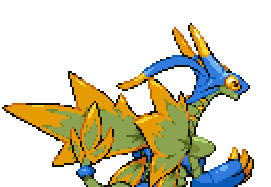 Flygon has the same base Attack as its base form, Trapinch. Flygon's EV Yield (1 Attack, 2 Speed) is unique. Flygon and its pre-evolution are the only Dragon-type Pokémon belonging in the Bug Egg Group. 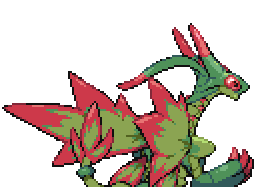 Flygon is the only Pokémon which gains Bug typing when evolving or Mega Evolving. 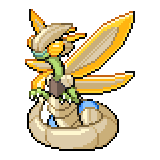 Therefore it is also the only Pokémon which loses a type in favor of Bug when evolving or Mega Evolving. 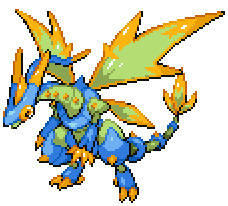 Flygon is also the only Pokémon to lose its primary type upon mega evolving. Mega Flygon is the only Pokémon with a base stat total of 620. 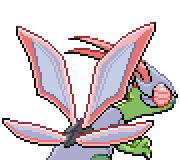 Mega Flygon has the highest base stat total and base Special Attack of all Bug-type Pokémon.